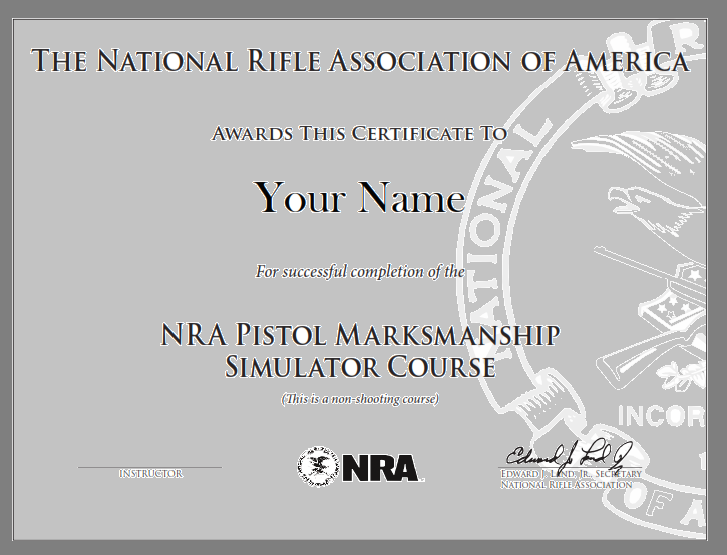 The NEW NRA Pistol Marksmanship Simulator Pistol course teaches the basic knowledge, skills, and attitude for owning and operating a firearm safely. This course is designed to provide an individual the experience to learn the basics of firearm safety and shooting skills in a classroom environment using state of the art computer based simulation. This environment provides an individual a learning opportunity where live fire is not a requirement. The simulators used at Tall Guns are used by law enforcement, the US Military, shooting sports competitors to improve skills and accuracy with various firearms types. This course is at least 2.5 hours long and includes classroom and simulator range time. and continued opportunities for skill development and courses. The scheduled class is taught at our Loveland, Colorado facility. (Lesson Plan 1st edition, 2014).